On Sunday January 30, Richard Hammond, one of the presenters on the BBC’s popular car show Top Gear, made these comments while talking about the Mexican designed car Mastretta: “Mexican cars are just going to be lazy, feckless, flatulent, overweight, leaning against a fence asleep looking at a cactus with a blanket with a hole in the middle on as a coat.” These and other comments during the show have become a big topic of discussion in the national blogosphere. El hecho fue que en dicho programa en vez de analizar al vehículo como tal, solamente se dedicaron a criticar al pueblo mexicano a base de estereotipos ignorantes y mal fundados, llegando incluso a ofender al embajador de nuestro país en Inglaterra. The fact is that in the program, rather than analyze the vehicle as such, the presenters devoted their time to criticizing Mexican people based on ignorant and ill-founded stereotypes, even offending the ambassador of our country in England. Jeremy Clarkson, another of the show's presenters, said: “We won't get any complaints about this because the Mexican ambassador's going to be sitting there with a remote control like this.” Mexican Ambassador to the UK, Eduardo Medina-Mora, has written to the BBC asking for an apology. ¿A quién le dolió y porque las palabras que dijeron en el programa ingles Top Gear? A MI SI. Pero que quede claro que no estoy siendo patriotero buscando el ser el líder de una noche de los cuchillos con antorchas y demás en contra de los británicos. Who got hurt –and why– with the words they said in the English program Top Gear? I DID. But let me be clear that I am not being patriotic trying to be the leader of a [revolt] with torches, knives and other things against the British. Así que si en verdad reviso el cumulo de tonterías que dijeron en TopGear me queda claro que a) el conductor es inútil torpe que no sabe ni siquiera de que habla, b) no puedo darle el título de conocedor si basa su criterio al hablar de autos pro el país de donde vienen y por ultimo c) ni siquiera tiene los pantalones en twitter para dar la cara sino que cierra la cuenta y se va.
Apoyo la queja interpuesta por el embajador Eduardo Medina Mora por esta manera tan absurda e irresponsable de hablar de un “conocedor” pero con el tacto y el criterio de un hipopótamo al tocar el piano. So if I actually review the bunch of nonsense they said in TopGear, it is clear to me that a) the presenter is useless and dumb and doesn't even know what he is talking about, b) I cannot give him the title of an expert if he bases his approach to discussing cars according to the country they come from and finally c) the presenter does not even have the pants to come forward on Twitter and instead closes the account and leaves. I support the complaint filed by Ambassador Eduardo Medina Mora, for this absurd and irresponsible way of speaking by someone that is “knowledgeable” but has the tact and judgment of a hippopotamus playing the piano. Lo más sorprende de todo es que esto suceda en un país que se precia de reírse hasta de sus muertos con un humor sabrosón, y sin embargo ahora refunfuña porque alguien le dijo cositas feas similares a las que dicen los niños de primaria. No deja de llamar la atención que andemos requete indignados ahora que los british nos sacaron la lengua, cuando en los programas de humor de Estados Unidos somos blanco de burlas todos los días, como los son los negros, y los judíos, y los irlandeses, y los white trash… se trata de humor y nada más, no pasa nada. Como ayer dijo alguien en Twitter: si por cada chiste en el que nos burlamos de otras razas hubiera una reacción como la de México, ya estaríamos fuera de la ONU. The most surprising thing is that this happens in a country that prides itself on laughing even about their dead with a great sense of humor, and yet now [the country] grumbles because someone said mean little things similar to those that schoolchildren say. It doesn't cease to call my attention that we are super angry now that the British stuck their tongue out at us, when in comedy programs from the Untied States we are teased every day, as are blacks, and Jews, and the Irish, and “white trash”… it's humor and nothing more, it's not a big deal. As someone said on Twitter yesterday: if for every joke in which we make fun of other races there was a reaction like Mexico's, we would be out the UN. Apparently many Mexican internet users didn’t take the kind of offense at the show that the ambassador did, if the remarks posted on the El Universal website are any indication. Many showed the refined sense of irony that I personally find refreshing in Mexicans. 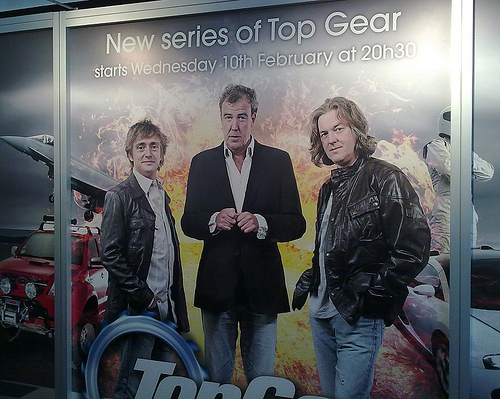 A Mexican student in London accused Top Gear of racism and asked lawyers “to bring a test case against the show,” as reported by The Telegraph. The Executive Producer for Top Gear has written to the Mexican Ambassador and apologised for the comments made about him during the show. On the broader issue of comments about Mexicans as people, the show has explained they were making comic use of a stereotype; a practice with which regular viewers of Top Gear will be familiar. “We are sorry if we have offended some people, but jokes centred on national stereotyping are a part of Top Gear’s humour, and indeed a robust part of our national humour. Our own comedians make jokes about the British being terrible cooks and terrible romantics, and we in turn make jokes about the Italians being disorganised and over dramatic; the French being arrogant and the Germans being over organised. When we do it, we are being rude, yes, and mischievous, but there is no vindictiveness behind the comments. Sounds like Great Britain has its own pack of ignorant Teabagger type mentality. Thanks Top Gear for giving us a reason not to watch your show. Personaly I am not offended by the Tortilla and lazy jokes, the first one was amussing and the second one I would expect from some who has never been in Mexico and their only knowledge of our culture is throght cliches; however, I found exesive when the messed up with our food and Embassador. Porfavor avisenme con anticipacion cuando vienen a promover su programa a Mexico para ir a recivirlos al aeropuerto personalmente en el vuelo directo del UKKK a Mexico….. Please let me know when they would come to Mexico to promote there program just so I can personaly wait for them at the airport I would imagen they would fly straigth from UK”KKK” to Mexico… Please post my comment you know is all in good fun. I DO AGREE with “Mexican designed car Mastretta: “Mexican cars are just going to be lazy, feckless, flatulent, overweight, leaning against a fence asleep looking at a cactus with a blanket with a hole in the middle on as a coat.” Even a little bit rude OR IRONIC. INSTEAD OF STUPID EMOTIONAL “PATRIOTIC” REACTIONS; WHY NOT REVIEW MEXICAN EXTERNAL WRONG BEHAVIOR AND USE THIS CRITIC AS A POSITIVE FEEDBACK INPUT TO IMPROVE? THERE IS OTHER KIND OF HIGH LEVEL CULTURE IN MEXICAN PERSONS; NOT THE TELEVISA MORONIC KIND. Hey Mexico! Please don’t be offended when the English make jokes about you! Political correctness is so dull – it has turned the entire United States into a bunch of stiffs (I happen to be American). The rest of the world is so much fun because they can still make jokes!! This is important. When the English make jokes about you, it means THEY LIKE YOU!! And, there is nothing the English would like more than if YOU MADE JOKES ABOUT THEM!! Any stereotypes you want, accurate or not, if it is funny the English will laugh, and they will think there is nothing so clever as a Mexican making jokes about an Englishman. Please don’t turn into another United States of America – where no joking is allowed.